Christmas vacation was plenty awesome, but I'm so happy to be back and in the old groove! Finally have my house in order, a few projects underway, and am ready to start posting! For this, my first post of the new year I just want to say thank you again to all the people who follow my blog! 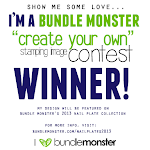 I will be posting my very first giveaway to celebrate reaching 100 followers soon so keep in touch! Also I won some super cool Broadway Nails from Dollface's giveaway just before Christmas, so when I got back there was this parcel waiting! Thanks Dolly! I've never given fakies a try, but the timing couldn't have been more convenient, because I have a really busted up nail that's just growing out and catching n everything, so covering it with a fake one has been awesome. I'll post about that soon as well! Without further ado, I give you two manicures (on my real nails) done just after arriving at home for my vacation. This one is done using a base colour of 2 coats Sally Hansen Complete Salon Manicure Commander in Chic, Sally Hansen X-Treme Wear Black Out (and my Art Deco striper in black) to do the tips, then over the tips with a sponge Sally Hansen Diamond Strength Diamonds for a little glitz. 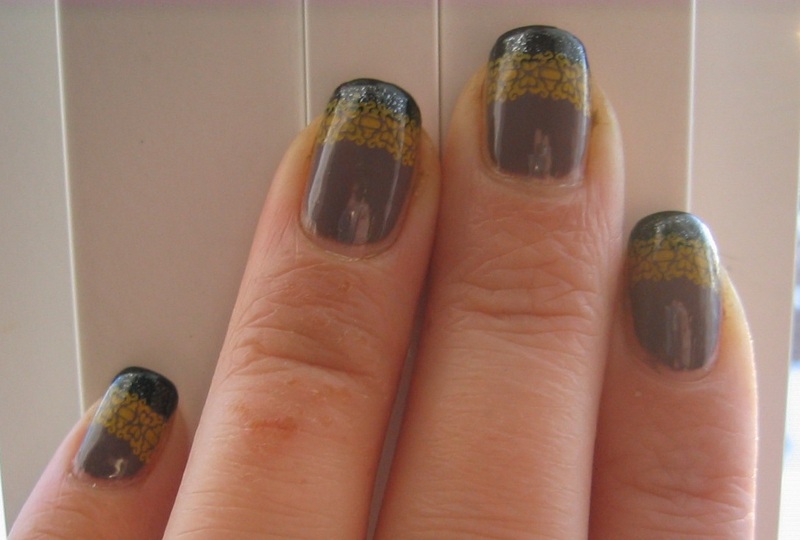 I finished with a stamp from Bundle Monster image plate BM11 and my Konad Princess stamping polish in Yellow. 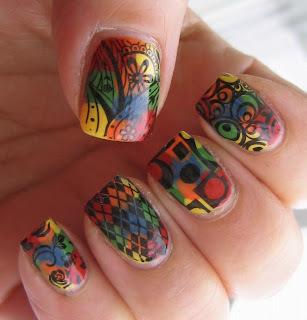 I can't remember exactly where I first saw someone use splotches of nail polish under a full nail stamp but I totally dig the effect. I did like 4 manicures on family and friends with the same concept. Here's mine. Base: splotches of OPI Off With Her Red, Pamplona Purple, Green-wich Village, Sally Hansen Insta-Dri Lightening, and Complete Salon Manicure Thinking of Blue. 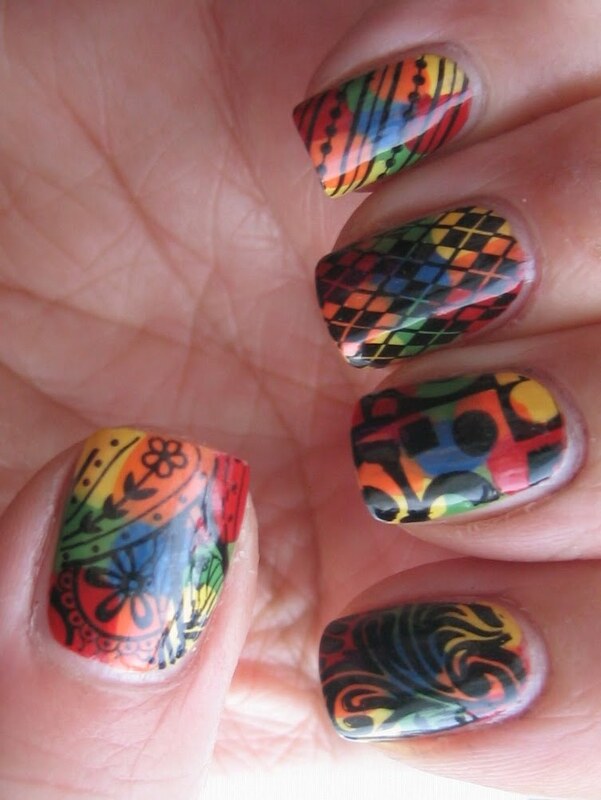 Stamp: GOSH Nero polish and random Konad and Bundle Monster full nail stamp images. OH MAN I totally need to do a post just for GOSH nail polish because I'm loving them. Mostly because the Metallic Green, Metallic Purple and Metallic Blue as well as Nero all work beautifully as stamping polishes. Wee! I packed a mega-haul over the holidays! I got my very first ever OPI polishes and the formula is like butter and the brushes make me so happy. I also find that I'm pretty happy with the Sally Hansen Complete Salon Manicure polishes, and my favorite polish gift this Christmas was from my sister in law who got them for me in Finland (I don't know if they are sold in Canada) IsaDora Plain White, and IsaDora Graffiti Nails in Subway Green. Seriously as soon as my bashed in nail grows out I'm doing a review on that! Okay well I feel way better now that I finally got online and made a post! Hope everyone is having a wonderful new year so far. Both of these manis are great! I'm slightly totally in love with the splotchy argyle. Ok... um.... PLEASE EXPLAIN how you did the rainbow splotches! So awesome! Love both manis JQ, but favorite is the second one. Welcome back, can't wait to see the new collection and your guest swatches. Glad you're back! Totally love the argyle over the splotches. Awesome effect! Thanks everyone! :D I'm glad you dig it! Welcome back! I'm loving both of these manis, and I have got to try the second one sometime!